The La Quinta Inn & Suites Eugene has been awarded the 2018 TripAdvisor Certificate of Excellence award Enjoy the relaxing waterfront setting of the La Quinta Inn & Suites Eugene, located on the banks of the Willamette River next to Alton Baker Park and the University of Oregon's Autzen Football Stadium. Our pristine location is perfect for every occasion. Guests have easy access to Eugene's bike path and walking trails, downtown, shopping at Valley River Mall and Oakway Center, 5th Street Public Market, University of Oregon Campus, and the Hult Center for the Performing Arts. We are located just a few miles from the Lane County Fairgrounds and Expo Center. Take a scenic drive, enjoying nearby historic covered bridges, waterfalls and wineries. Enjoy nearby golf and white water rafting. The Oregon Coast is a relaxing one hour drive away. The La Quinta Inn & Suites Waterfront Eugene has a 24-hour fitness center, guest laundry, heated indoor swimming pool, spa, and gift shop. Stay connected with free high speed wireless internet access and a 24-hour business center. Enjoy several restaurants in close proximity to the hotel. Start each day with a delicious Free Bright Side BreakfastTM served fresh each morning. 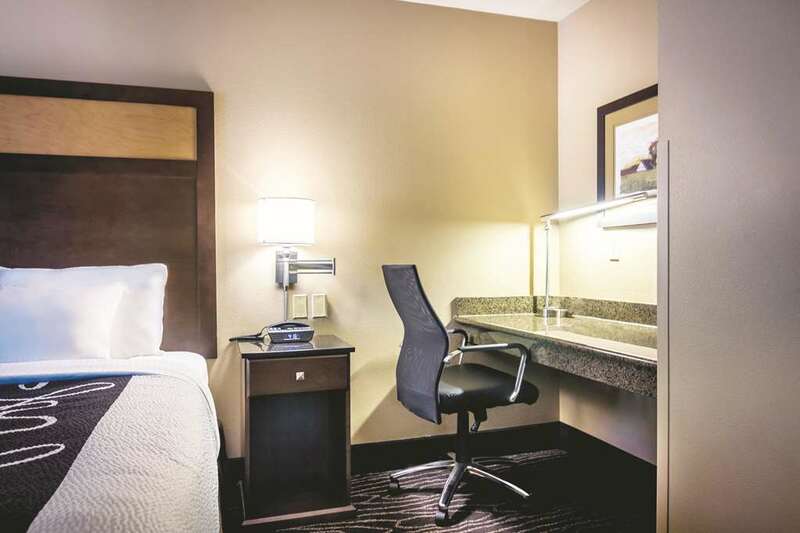 All of our comfortable rooms come with such amenities as a refrigerator, microwave, coffee maker, high speed wireless, satellite-TV, and more. Pets are welcome. Conveniently located near Autzen Stadium. Olive Garden Italian Restaurant: Delicious Italian Entrees, including unlimited servings of famous soup or salad and warm breadsticks, served in the spirit of Italian generosity. Located next to the Willamette River and Alton Baker Park. Adjacent to miles of Eugene bike trails and the Pre running trails. Valley River MallTax free shopping, wide variaty of stores.